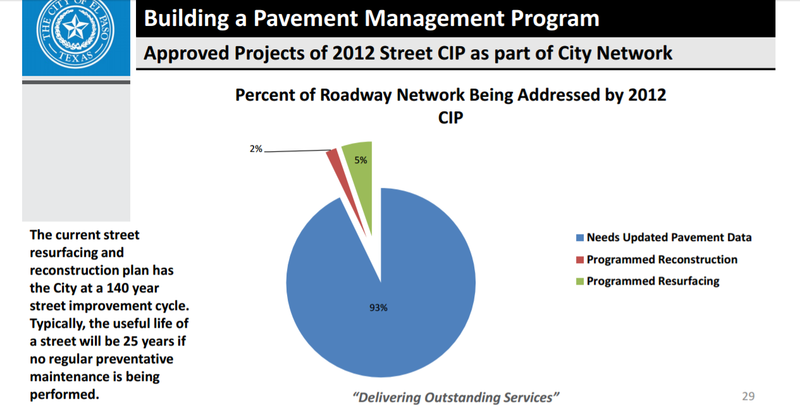 It is not as though city staff has not told city council how bad the street situation is. On the left side you can see that staff is telling council that roads that are not maintained (like ours) should generally last 25 years. They are also pointing out that with the budgets that council has been passing we are on a 140 year cycle. This entry was posted on Tuesday, April 18th, 2017 at 5:00 AM and is filed under City government. You can follow any responses to this entry through the RSS 2.0 feed. You can leave a response, or trackback from your own site. Hysterical! 140 year old streets? At least paint the God D*** stripes on the so called streets! Sorry but do NOT need a graph to know how bad El Paso streets are..
Yep, they are passing the buck . . . to the next generation(s) of Mayor and City Council(s). You all will be dead by the time they re-surface your street.